The global power competition is resurgent and the US is at risk of falling behind without strategic technology research and development, according to Dr. Michael Griffin, the first undersecretary of defense for research and engineering. 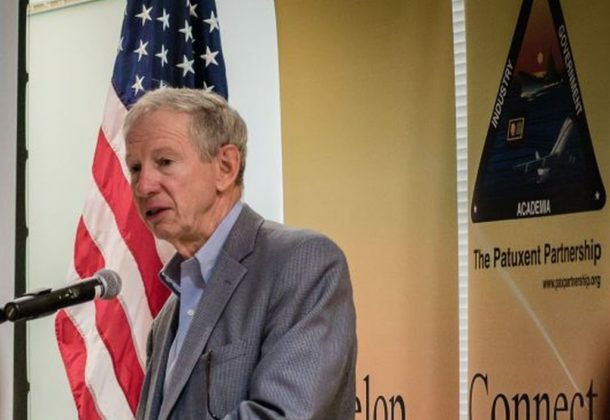 Dr. Griffin described current defense modernization focus areas to attendees at a July 13 briefing with The Patuxent Partnership about the new organization created to ensure US military technological superiority. “I’m in charge of all the stuff we’re not already buying,” Dr. Griffin said. The Department of Defense (DoD) Research and Engineering Enterprise (R&E) was created in the 2017 National Defense Act Authorization as part of the “first significant reorganization of the Pentagon,” Dr. Griffin said, since the 1986 Goldwater-Nichols DoD Reorganization Act signed by President Ronald Reagan. Responsible for the research, development, and prototyping activities across the Department of Defense, Dr. Griffin oversees the activities of the Defense Advanced Research Projects Agency, the Missile Defense Agency, the Strategic Capabilities Office, Defense Innovation Unit Experimental, the DoD Laboratory enterprise, and the under-secretariat staff focused on developing advanced technology and capability for the US military. Despite his praise for current defense department leadership and strategy, Dr. Griffin said the US is threatened with losing its position as the undisputed leader in technology. America’s technological superiority led to the decisive victory of the allies in World War II and the rule-based international order that had governed warfare for 70 years. The “peace dividend” following the end of the Cold War eventually led to reduced defense spending, beginning a steady reduction in funding for research and development. The belief at the time was the future would contain a series of smaller events. Conditions in the Middle East were viewed this way – as relatively small and singular events – even after the 9/11 attacks. Yet, even as Pentagon funding increased, the urgency of responding to 9/11 did not reinvigorate the long-term efforts needed to sustain America’s technical edge. This has enabled a global power competition to return, said Dr. Griffin, citing Russia and China as top adversarial competitors. Dr. Griffin stressed, however, that the US has not fallen behind in its research or development. The gap exists between development and capability. Focus areas of modernization for R&E, specified in the National Defense Strategy, include hypersonic weapons, space offense and defense, cybersecurity offense and defense, directed energy, artificial intelligence, and machine learning. Hypersonic missiles move at least five times the speed of sound, which permits them to stay low and avoid detection, and are maneuverable. The US pioneered the hypersonic field, Dr. Griffin said, in the years when the space shuttle was being developed. Because US nuclear capabilities were an effective deterrent, “we never chose, as a nation, to weaponize that capability,” said Dr. Griffin. “Well, our adversaries are doing so,” he said. “How many of you got the letter from [the Office of Personnel Management] saying that your personally identifiable information was compromised?” he asked, to a burst of laughter and raised hands from nearly everyone in the room. “What do we have today that is not vulnerable to cyber intrusion? It’s getting to be an increasingly short list,” said Dr. Griffin. While taking questions from the audience, Dr. Griffin concurred that current government processes have stymied rapid transition from development to useable technology. “You will never begin to solve a problem that you don’t admit that you have and this is the first time in literally decades that we have recognized that the global power competition remains with us,” said Dr. Griffin.